Come hear author and 2009 Nobel Peace Prize nominee, Greg Mortenson, discuss his newest book: Stones Into Schools. 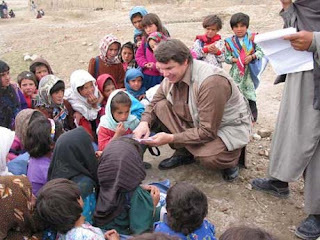 When: Tuesday, December 14th at 7:00 p.m.
Mortenson's previous book, Three Cups of Tea, is an international best-seller and shares the story of his work in Pakistan. Stones Into Schools chronicles his journey of establishing schools for girls in Afghanistan. Education is a key component in the fight against human trafficking. Mortenson and those who work alongside him provide girls with the opportunity to reach their potential and to look forward to a fulfilling future.